Micromeritics' Grant Selection Committee has selected the recipient of its grant award for the second quarter of 2010. An ASAP 2020 Accelerated Surface Area and Porosimetry System with micropore and chemisorption options has been awarded to the Department of Chemical Engineering at the Pennsylvania State University, University Park, PA, USA. According to Dr. Robert Rioux, Principal Investigator, "We are working on a number of projects that are quite diverse ranging from studies involving adsorption in porous materials, synthesis of new porous materials and their characterization, the evolution of porosity, surface composition of nanostructures (with magnetic and catalytic applications), and the characterization of catalytic materials (active surface area, isosteric heat of adsorption). The ASAP 2020 micropore option is necessary for studies of microporous and mesoporous silica materials, including a series of new zeolitic materials and mesoporous silica materials that have been discovered here at Penn State. The chemisorption option will allow us to determine the number of active sites in a multitude of heterogeneous catalysts that include single-site, tethered organometallics, nanoparticles embedded in nanoporous carbon, and colloidal synthesized nanoparticles encapsulated in a mesoporous silica matrix. I am particularly interested in using the various adsorption models to determine the isosteric heat of adsorption for comparison with calorimetric experiments of the differential heat of adsorption." 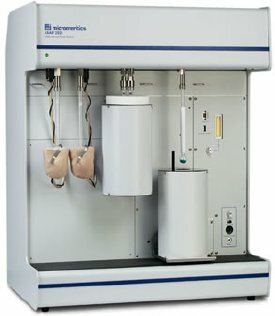 Micromeritics' Instrument Grant Program is intended to provide particle characterization instruments to non-profit universities and research organizations for the purpose of fostering and supporting meritorious research projects. A maximum of one instrument/integrated system will be awarded per calendar quarter. The next grant decision will be made prior to 9/30/10. The next application deadline is also 9/30/10 for a 12/31/10 grant decision.